What's the Deal with Video Testimonial Software and Apps? What’s the Deal with Video Testimonial Software and Apps? Home Blog What’s the Deal with Video Testimonial Software and Apps? Video testimonial apps and software automate the process of collecting video testimonials from customers. Most video testimonial apps make it possible to prompt customers for specific testimonial content, secure the customers’ permission to use the testimonial for promotional purposes, manage the review and placement of videos, and encourage customers to share their video contributions. Like all testimonial videos, videos collected through apps provide social proof that your company, its products and services, really perform as advertised. They can help with reputation management and encourage buying behavior. Is a video testimonial app right for your company? With the ability to gather an manage testimonial video content from your customer so easily, should you invest in testimonial software or would you benefit more from professionally produced video testimonials? What kind of product or service do you sell? If your product or service is consumed by your target market in roughly the same way by everyone, or if you sales process is relatively simple, a testimonial video app may be just the thing you need. 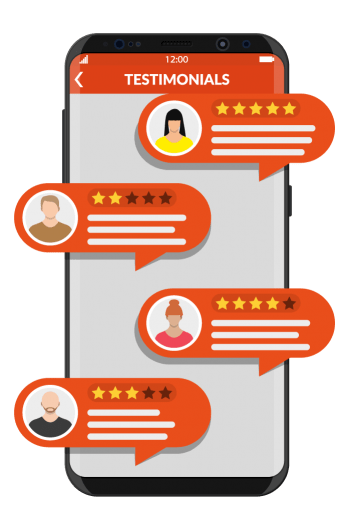 Restaurants, retail stores, and home repair services are just a few of the companies that can probably use testimonial video apps effectively. On the other hand, if what you sell is used in different ways by different customers, or if you have a complicated sales process, you made require a bit more horsepower from your testimonial videos. Enterprise software companies, heavy equipment manufacturers, and financial services firms will probably benefit from more structured testimonials. Does it matter who gives the testimonial? If your customers are non-specific members of the public, a testimonial video app is likely to serve you well. So, for example, if the people who eat at your restaurant do so because they enjoy great food and service at a terrific price, you really don’t care who they are. You only care that they’re satisfied customers, willing to tell the world how great your restaurant is. Conversely, if the power of your testimonial videos depends, in part, on the particular expertise, stature, or industry reputation of the people providing the video, a testimonial video app is less likely to deliver the content you need. How many testimonial videos do you need? There’s definitely something to be said about the wisdom of crowds. People don’t want to be left out or left behind. If it seems like everyone owns your product already, that’s a great way to encourage other people to buy. Numbers really count in that situation, and testimonial video apps are probably the most cost-effective way to rack up an impressive number of testimonial videos. On the contrary, if your product appeals to a relatively limited market, number won’t be nearly as important as a few exceptional testimonial videos, from buyers who really count. A testimonial video app probably won’t be of much use to you, under those circumstances. Testimonial video apps are dependent upon the people and equipment of the people filming the videos. You can save a lot of money and time by crowd sourcing your testimonial videos, but you’ll have relatively little control over what the videos look and sound like. With a more full-featured video testimonial service, you have almost complete control over production values. A film crew will see to it that everything is well lit, in focus, and intelligible. If your brand depends on production quality, a testimonial video app is probably not going to work for you. We live in a post-truth world, folks. Video testimonials still provide a great source of social proof, but their power has been somewhat diminished in recent years. I can’t tell you how many times we have been approached to help manufacture bogus testimonial videos, complete with actors and fictional scripts. A recent study shows that up to 15% of online review are fake. Testimonial video apps do not trade in fake reviews. However, it’s easy to imagine that video testimonials of low quality, featuring often unnamed members of the public might be harder to believe than high-end videos from named subjects, working at identifiable brands. Testimonial video apps are an affordable option for brands that can benefit from customer-produced testimonial videos from a relatively broad segment of their target market. Brands that require higher production values, testimony from specific customers or types of customers, involved or complicated storylines in support of more involved or complicated products or services, will be better served by more traditional testimonial video services. Of course, the obvious downside to all these options is that they are more expensive than the services provided by a reputable testimonial video app. That’s because apps provide you with less control over some very important features relative to the control over those features provided by the more traditional services. If you need that additional control, it will come as no surprise that you’re going to have to pay for it. What’s the right type of video production company for your marketing project?